An Unfit Message From A Fitness Club? Huh? Have I just been transported back in time to my grade school, where it wasn't uncommon for a frustrated teacher to decide to punish the entire class until the culprit who actually flicked the rubberband at her when she had her back turned would come clean and admit it??? Last time I checked I PAY A MONTHLY FEE to be a member of the gym, and as part of that membership I feel I am entitled to a freely flowing soap dispenser in the shower! SHOULD PAYING CUSTOMERS PAY FOR THE BAD BEHAVIOR OF A FEW? Clearly there is a problem, and whomever is "vandalizing" the shower soap dispensers should be discouraged from such unclean behavior. However, that should be LA FITNESS' problem and not mine. What message does it send to us customers who actually get our exercise by using, rather than abusing, the equipment and facilities? Is management so incapable of maintaining order and decorum that they have to take out their frustration on the good guys? 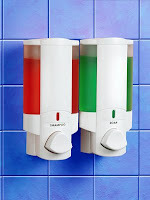 Perhaps I am overreacting but it seems to me that the note above will NOT deter the elusive soap scum from continuing to dispense with the dispensers. More importantly, the note above (and soap-less showers) will only serve to annoy the well-behaved customers and leave us awash with a dirty feeling that our club doesn't care very much about its members. A WEAK ECONOMY REQUIRES STRONG CUSTOMER SERVICE! Now more than ever it would seem to me that businesses need to go out of their way to express their appreciation for good paying customers, especially businesses that rely on recurring charges. As all of us tighten our belts and scrutinize our personal and professional budgets we are going to carefully evaluate how and where we spend our money. In most cases, the recipients of our spending will be those companies that offer us quality goods and services, and make us feel welcome and appreciated for giving them our business. For me, the note above fails to communicate the proper message to the majority of the club's members. What do you think? Is it fair for a business to lower its standards across the board because of a few bad customers? 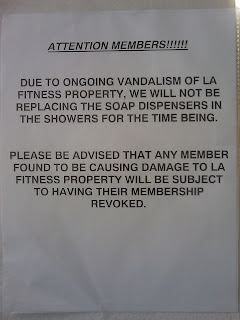 Is the note above a fit way for LA FITNESS to address their vandalism problem? Should I get off my "soap box" and get back on the elliptical machine? Please leave a comment and let me know what YOU think!